Studiopress Genesis Theme Framework is a complete theme framework designed by studiopress that can incorporate child themes, its very simple to understand, you add Genesis to your themes folder on your shared hosting and activate it, you add your child theme and activate it and — voila! 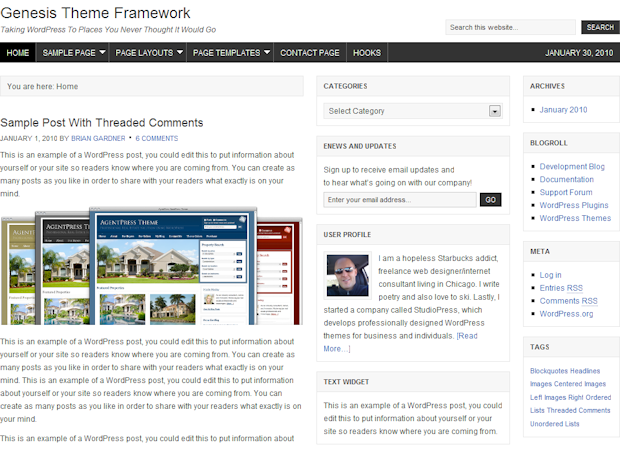 you have Genesis theme framework running under child theme. The Genesis child themes look amazing with a great layout and the ability to quickly switch between each other, The package include all the child themes available. Genesis has a huge amount of options you would expect in this amazing designed framework. Note: This latest version of Genesis theme requires WordPress 3.2 or higher, so anyone running an older version of WordPress may get an error when activating the theme.